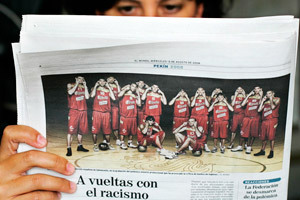 BEIJING -- Players on Spain's Olympic basketball team defended a photo in an ad showing the players using their fingers to apparently make their eyes look more Chinese. The photo, which has been running as a newspaper spread in Spain since Friday, shows all 15 players making the gesture on a basketball court adorned with a Chinese dragon. The photo was part of a publicity campaign for team sponsor Seur, a Spanish courier company, and is being used only in Spain. It was something like supposed to be funny or something but never offensive in any way," said Spain center Pau Gasol, who also plays for the Los Angeles Lakers. "I'm sorry if anybody thought or took it the wrong way and thought that it was offensive." Point guard Jose Calderon said the team was responding to a request from the photographer. "We felt it was something appropriate, and that it would be interpreted as an affectionate gesture," Calderon, who plays for NBA's Toronto Raptors, wrote on his ElMundo.es blog. "Without a doubt, some ... press didn't see it that way." International media criticized the photo. London's Daily Telegraph said Spain's "poor reputation for insensitivity toward racial issues has been further harmed" by the photo. "This was clearly inappropriate, but we understand the Spanish team intended no offense and has apologized," Emmanuelle Moreau, a spokeswoman for the International Olympic Committee, said in an e-mail. "The matter rests there as far as the IOC is concerned." The OCA, an organization representing Asian-Pacific Americans, also found the photo disturbing. "It is unfortunate that this type of imagery would rear its head at a time that is supposed to be about world unity," George Wu, the group's deputy director, said in a statement. The Spanish women's basketball team also posed for a photo doing the same thing, and four members of Argentina's women's Olympic soccer team were shown making similar faces in a photograph published last week. Gasol said it was "absurd" people were calling the gesture racist. "We never intended anything like that," he said. The Spanish basketball federation declined to comment Wednesday. A Seur official in Madrid said the company had not intended to offend the Chinese people, but has no immediate plans to withdraw the ad, which is scheduled to run on selected days until the end of the Games. Seur has not received any formal protest or complaint from Chinese authorities, the official said on condition of anonymity because she was not authorized to speak publicly about the situation. It's not the first time Spanish sports has encountered questions over racist attitudes, and the photo comes at a time when Madrid is vying to host the Olympics. "We're surprised by the remarks of racism," said Juan Antonio Villanueva, communications director for the city's 2016 Olympic bid. "Spain is not a racist country -- quite the opposite." Formula One driver Lewis Hamilton was subjected to verbal abuse at a Barcelona circuit in February, while former Spain coach Luis Aragones also used a racist remark about France striker Thierry Henry to motivate one of his players. "Monkey" chants rained down on England's black players during an international friendly against Spain in a match played in Madrid in 2004, soon after Aragones' outburst. The basketball federation had just signed a four-year contract extension with Chinese clothing brand Li Ning shortly after arriving in the Chinese capital for the Games. "We have great respect for the Far East and its people, some of my best friends in Toronto are originally Chinese, including one of our sponsors, the brand Li Ning," Calderon wrote. "Whoever wants to interpret it differently is completely confusing it." Frank Zhang, Li Ning's director of government and public affairs, played down the incident. "We don't think this is an insulting gesture to the Chinese," Zhang said. "In fact, the gesture shows that the Spanish team is so humorous, relaxing and cute. They sat around a dragon pattern, which we think showed respect to the Chinese. "Li Ning Ltd. will not change any business plans with the Spanish team because of this," Zhang added. "People should focus on great Olympic Games instead of something else." World champion Spain is 2-0 at the Olympics after rallying to beat China 85-75 Tuesday while consistently getting booed.